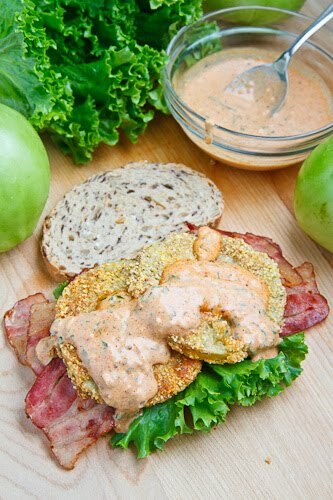 A twist on the classic BLT swapping out the ripe red tomatoes for crispy cornmeal coated fried green tomatoes and adding a tasty remoulade sauce. Over the last few weeks I have been enjoying a lot of BLTs and when I made the fried green tomatoes the other day it reminided me of how much I enjoy fried green tomato BLTs. 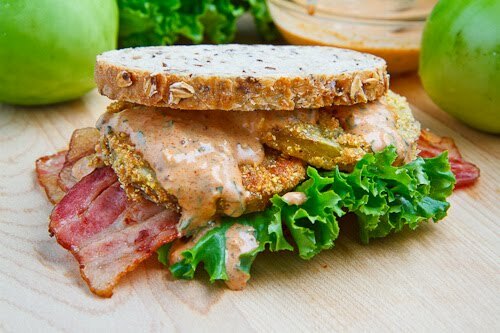 A fried green tomato BLT is just like it sounds, a BLT sandwich where the ripe red tomatoes slices are replaced with gried green tomato slices. These sandwiches take a bit more work to make than your regular BLT but it is well worth the effort! 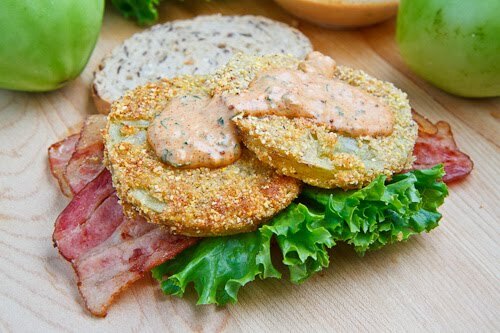 The crispy coated tart and tangy fried green tomatoes go really well together with the salty bacon and the fresh lettuce. Although a smear of mayonnaise is grat on these gried green tomato BLTs, I often loke to go with a tasty remoulade sauce instead. Am i the first one to make a comment on your blog post? 🙂 This sandwich looks awesome. I can't believe you used to eat boring food but look what you're making now. BLT with green tomatoes instead of the red one is a great idea. Such a lovely sandwich with lots of flavor. mmmm looks so good. I love that I can see the texture from each component in the picture, makes for a very appetizing photo! looks delicious. I often dredge chicken or tofu in a similar fashion as the green tomatoes. Exceptional BLT once again. You have been the BLT zen master lately! Oh, that's heavenly! I love Blt's. That has my name written all over it. Yum, Kevin. Yum. I love making Friend Green Tomato BLT's when I have people over for Brunch, and I usually spread some Boursin Cheese for extra goodness! I think for the first time ever I wish that I liked tomatoes! Beautiful pic and fantastically creative idea! I love BLTs!!!! Nice touch with the fried green tomato. They do look perfectly fried, too. I'm going to try this next time I make a BLT. Another one here that loves BLTs. This one have looks awesome. I'll have to give it a try. That sandwich is to die for! Mmm…this almost sounds better than the BLAST. Oh Lord! I need to make sure my bf doesn't see this post. He'd ask me to make it every day for every meal! It looks delish! Wowzers! This is a great picture. You have taken Fried Green tomatoes took another level! Lookin forward making this! The food looks tempting what with the presentation and the fine ingredients. Great food goes so well with fine cigars. The aroma of tobacco, the texture of the leaves and the earthiness of the flavors are qhat set fine cigars apart. In case you would like to check great Cigars online, do make it a point to search the net. Those fried green tomatoes makes it more special..
Should I ever come across green tomatoes, this is definitely the sandwich I will make. Lovely! Still haven't tried making green tomatoes like this. Really must. Oh my!!! This is like southern meets sandwich!!!! This looks SO good!!! Dude – this may just be the best late summer sandwich idea ever! Wow. I am such a huge BLT fan (+Egg, +Avocado, whatever!) But I've never never thought of fried green tomatoes! Yummmm. I'll be making this immediately. What a great take on the classic BLT! Sandwich looks delicious!!! If you haven't tried a BLT with blue cheese crumbles, you must! It is incredible! this sandwich makes me miss Asheville, NC! A place called Sunny Point has this very sammie, and it is soooooooo delish! thanks for making my day, I need something pretty to look at. Be still my heart. I love this sandwich! I have had it a couple of times out a restaurant during tomato season and have loved it each and every time. Beautiful photo! Oh, yeah! I love a good fried green tomato. Loving all the great BLT's over here, Kevin. Just proves you can't get sick of a good thing! Oh my gosh, as soon as I saw this I thought, "why have I never thought of this!" It looks terrific! I love your use of acronyms … your BLAST sammie sounds great, too! Wow, what a fantastic variation on the standard BLT! I like the idea of a warm tomato in the sandwich. Fried green tomatoes on a BLT? That's all kinds of crazy! Crazy good, that is. YUM! I haven't eaten bacon in at least 10 years, but this sandwich might be the thing to get me to eat it again. Love the combination with fried green tomatoes — so Southern! I'm now on way to buy bacon. That did it. This looks great! Never had a fried green tomato! Fried Green Tomatoes bring back so many great memories of a dear great-aunt, who was much like Jessica Tandy. Your use of them in a BLT is brilliant! So, glad I stumbled upon your terrific blog. I LOVE this idea. Your sandwich looks amazing! Oh wow, I would LOVE that sandwich! I love fried green tomatoes! I really want this sandwich! What a great idea. omg. i just happened to pop onto your blog thru a link and this is what i see first?? this seriously looks amazing. i cannot wait to try it! We also use left over fried eggplant with the remoulade sauce to make a sandwich the next day. Will add bacon next time. I have a few more fried green tomatoes so I see this version in my future Kevin. You come up with some of the greatest ideas! I love, love, love fried green tomatoes. (I make mine a bit differently but I totally agree with you about the bacon grease.) I never ever thought to put them on a sandwich. (Usually I just stuff them into my mouth as fast as I can make them.) Thank you for sharing this sandwhich idea! Kevin, everything about this sandwich is fabulous! I fell in love with fried green tomatoes and who doesn't love a BLT? Now I want to try my hand at remoulade sauce. Perfect! oh, yeah, my kinda eatin'!! OK, this looks absolutely unbelievably delicious!!! I love any BLT of any type, but this one looks particularly yummy. Looks amazing! I want to make this but where does one find green tomatoes? I've noticed that not one person has mentioned difficulty finding them. I shop at Safeway, Walmart and our local fresh market and not once have I seen them. Chef Tracey: I actually have a hard time finding green tomatoes as well. In fact they are usually only available to me for a few short weeks in the fall around now at the farmers market. I am not sure why they are s difficult to get, I mean I am sure that the farmers have green tomatoes all summer but they only bring them in in the fall. I guess there is not as much demand for them up here. Good luck finding some! They are definitely worth trying! I'd bet replacing the green tomatoes with tomitillos would add a new ambiance -even roasted/charred! Tomitillos are always available all summer long, even in Ohio! You can even grow your own by just purchasing seeds over the internet. Then grow from the seeds you produce year after year. Randy: Fried tomatillos are awesome in this!